and Unforgettable to do while in Branson? 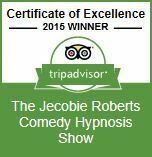 What people are saying about Jecobie Roberts Comedy Hypnosis Show. “Just saw the funniest show I have ever seen! “Unbelievable! I will never forget that show. "I went to Jecobie's Hypnosis Show not having any idea what I was in for. Jecobie's show ended up being the BEST SHOW I SAW WHILE I WAS IN BRANSON BAR NONE! This is one show you do not want to miss." Do you want to create incredible memories that will last a life time? Are you looking for a show that will have you and the audience participating, applauding, and laughing the entire show?